The party ready to depart Hadleigh Farm Colony. Alexander J. Grant, went to NZ as a boy farmer and served as a Salvation Army officer in New Zealand. He passed away in 2000. Via Salvation Army Archives New Zealand. It is always amazing the stories and photos that emerge from time to time, especially when you are involved with a local archive group. 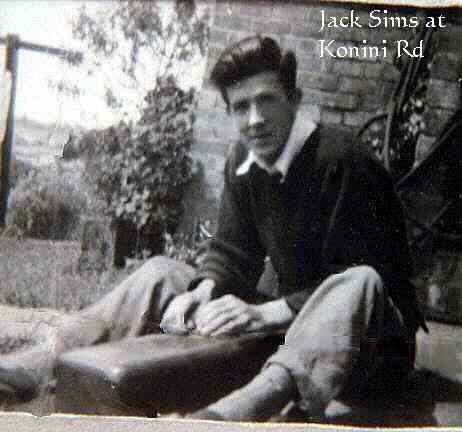 Recently an email arrived on our website from Rosanna Grattan from New Zealand, asking if we could help fill in any gaps with the research for her grandfather Jack Sims. She was watching an episode of ‘Who Do You Think You Are’ and it was about Dr Barnado’s Emigration Scheme, she remembered a photo that was in the family about her grandfather and proceeded to search the internet for Hadleigh Colony and came up with our website, (www.hadleighhistory.org.uk). 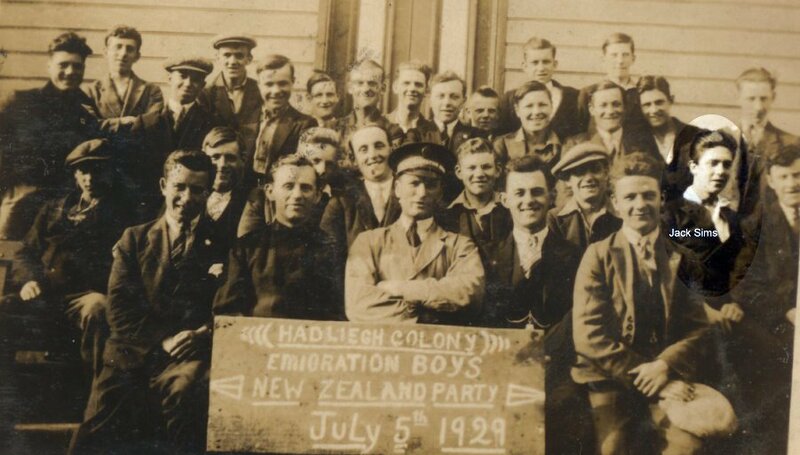 This photo showed a group of boy farmers ready for New Zealand in 1929, the board in front clearly showing HADLEIGH COLONY EMIGRATION BOYS NEW ZEALAND PARTY JULY 5TH 1929 and she has highlighted Jack Sims in the party. Her family originated from Kent where Jack Sims’ grandfather, Arthur West, had a saddle and harness making business. His great grandmother was Thomasina Boys of the Kent Boys of Betteshanger, so assumes something serious must have occurred for Jack to have come to Hadleigh Colony. 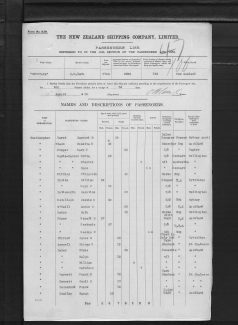 The vessel Jack sailed in was the SS Rimutaka which eventually arrived in New Zealand around 17th August 1929. For those who have purchased a copy of the new edition of ‘HADLEIGH SALVATION ARMY FARM; A Vision Reborn’ by Graham Cook and Gordon Parkhill, you will see on page 133 that this vessel is listed amongst selected sailings and Rosanna has also managed to get hold of the passenger list too. However, this sailing is of interest in that one of the passengers was a boy called Alexander J. 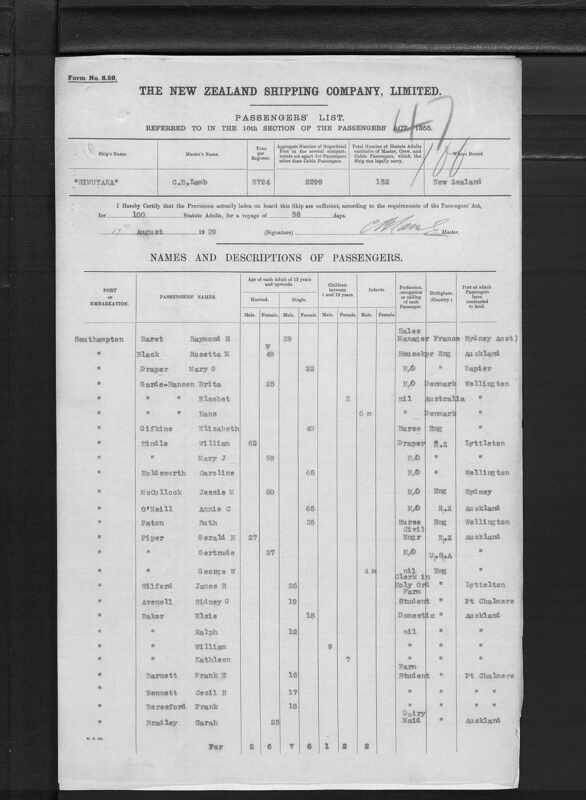 Grant, also seen on the passenger list and listed as a 19 year old farm student, a male and from Scotland. Looking further into the book, on page 146 you can read about Alexander J. Grant (known as ‘Scotty’). 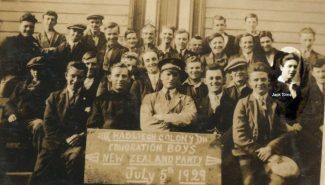 He responded to the Salvation Army Emigration Scheme offer and came to Hadleigh, initially he thought he was joining an organization which was something to do with the military, but he went on to train at Hadleigh Farm Colony for six weeks and was going to be sent to the Salvation Army Training Farm in Putaruru (NZ). It was while there that he became converted in the small hall at Hodderville Boys’ Home. He later offered himself for training to be a Salvation Army officer and left Cambridge (NZ) Corps in 1935 to enter the training college in Wellington. 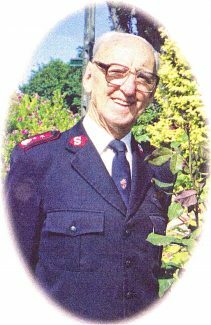 He married Captain Linda Proctor and they had one child, Heather, who married Don Jackson and served for many years for the Salvation Army in Hong Kong and Fiji. Alexander and his wife, after two appointments, moved back to Putaruru Training Farm and had many other appointments in both Church (Corps) and the Salvation Army’s varied Social Work in New Zealand. He retired in 1975 and passed away in July 2000 at the age of 90, his wife passed away in 1986. Thanks so much Graham for publishing the article about my grandfather Jack Sims. What an interesting story.I wonder if anyone can name the person in the middle of the picture as he looks as though he was the one in charge of the boys .My father at this time was head dairyman at Sayers Farm and I expect he had something to do with the training of these boys. His story is also on this site.